Digitization of education: Lucrative business opportunities abound in race to classroom of the future | Market Research Reports® Inc.
Digitization of education: Lucrative business opportunities abound in race to classroom of the future report is published on February 14, 2018 and has 25 pages in it. 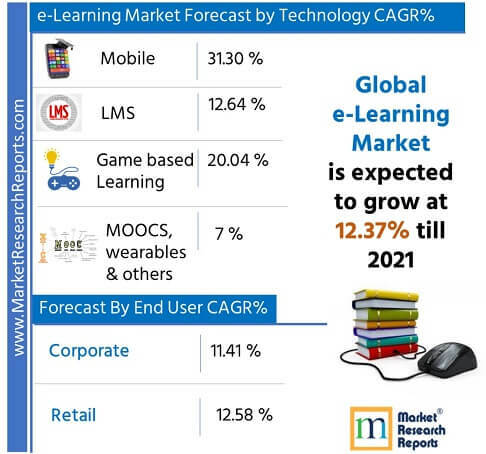 This market research report provides information about Technology (Education), Internet Education, E-Learning, Education, Business & Government industry. It covers Global regional market data and forecasts. It is priced starting at USD 995.00 for Single User License (PDF) which allows one person to use this report. Gamification of schooling is beginning to take hold, opening up new avenues in the sale of sophisticated devices intended to capture the attention of students in an era characterized by the frequent distractions of Wi-Fi, smartphones and social media. Across leading education systems greater amounts of investment are being placed into personalized learning, capturing the attention of companies such as Apple, keen to gain a presence in what is probably going to become a very lucrative market. Big data generates opportunities in creating new and improved learning experiences provided information can be properly managed. - Explores the gamification of education. - Examines the future role of technology in personalized learning. - Analyses the impact of big data on education. - Assesses the business opportunities presented by MOOCs. - Looks at the movement of big technology companies into schools. - What are the benefits of big data in education? - What are the business opportunities presented by technology in schools? - How will the classroom of the future develop? - Can MOOCs succeed in the current business environment?